Erkel Theatre was initially known as Nepopera as it was built by the Nepopera corporation. In return for the free venue, they took over the control of the regulation of the theatre. The idea of making this theatre was basically to bring Opera to the masses by making it reasonable. It was one of the very first Hungarian operas to come into picture as most of the plays were only in the Hungarian language. Eventually in the years to come, it associated with the State Opera House. With various changes and renovations, today Erkel Theatre acts as the secondary stage to the State Opera House. 30minutes prior the performance, the ticket office serve only visitors to the upcoming event. The theatre is accessible for disabled people. Bank cards are accepted for making the payment. Ticket price vary according to the shows. Check the official website of the theatre. How popular is Erkel Theatre? People normally club together Museum Of Applied Arts and Raoul Wallenberg Szakközépiskola és Szakiskola while planning their visit to Erkel Theatre. 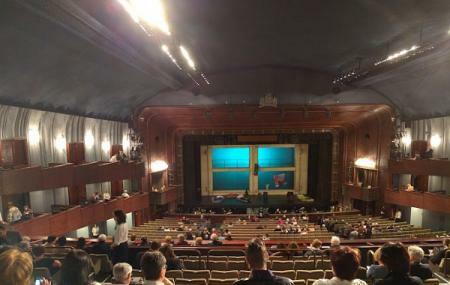 We were on a short visit to Budapest and decided to take see an opera at the Erkel Theater. The venue was spectacular, the performance was exceptional, and the price was reasonable. Hint: The Erkel Theater did not seem to enforce a strict dress code -- there were plenty of tourists mingled into the crowd wearing NY Yankees hats and ripped blue jeans ... I reccomend dressing a little bit nicer - a pair of slacks/pants/a skirt it will be appreciated and you will make the visit feel a little more special. Convenient to get to by train. Great sounds and acoustics. No bags or coats, so you will have to drop them off at the cloak section before you're allowed to enter. The view is great wherever you are seated too. Great place for concerts. I have been to several operas there. The quality of the performances has always been very good. The cloakrooms and the bars for refreshmets during the interval are also well run and good quality. I often have red wine and a "perec" during the interval. The bar is a little pricey.